Our vibrantly coloured and visually attractive circular classroom carpets have been designed for schools, pre-schools and nurseries. Designed to encourage children's knowledge of primary and secondary colours. 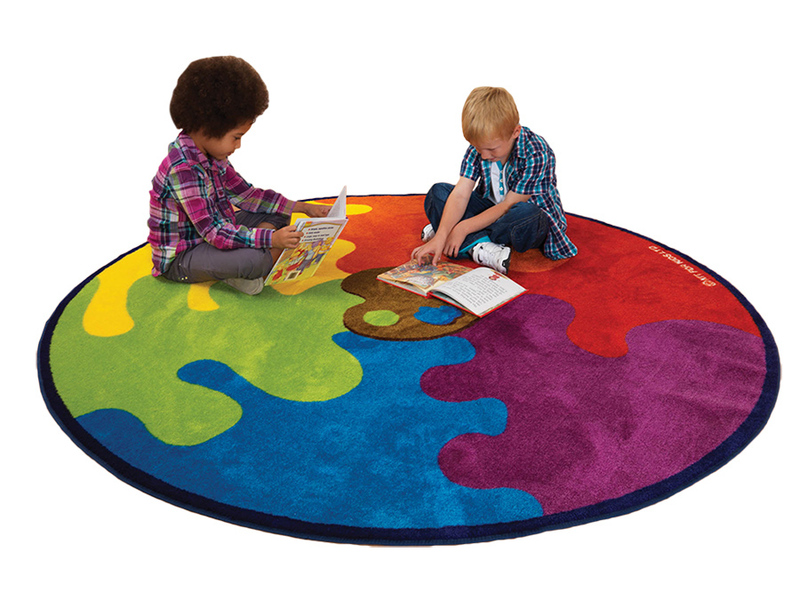 The brightly coloured educational rugs are ideal for group teaching activities, reading or interactive play and will brighten up any classroom. The colour palette classroom carpet is manufactured using an extra thick heavy duty tuf-pile which is specifically designed for comfort and longevity. The colour tubes classroom carpet is manufactured using a durable tuf-loop which is tightly woven and slightly thinner. Both of our colourful classroom rugs have tightly bound edges prevent fraying and the tuft strands meet heavy duty laboratory pull tests. Easy to clean, the anti-stain carpets can be spot cleaned with a damp cloth. The anti-crease feature allows you can roll up the mat and store it when not in use.